I started this piece on January 1, 2001 and completed it on November 29, 2001. The design is stitched on 28ct Platinum Linen. 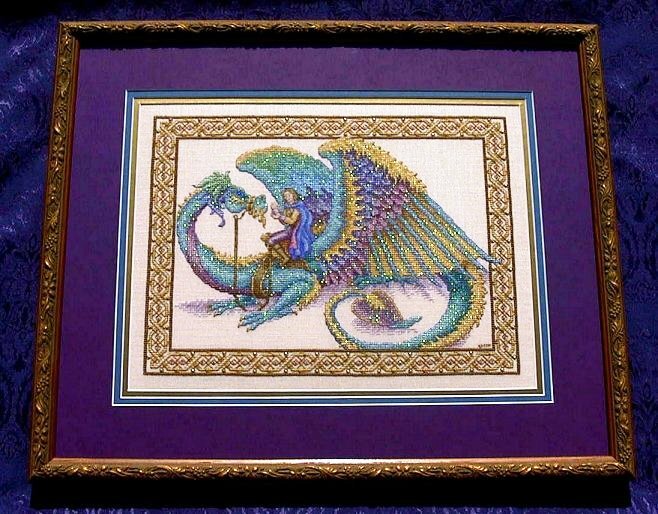 To the original design instructions, I added a layer of Prisms P-1 to the dragon creating a very sparkly effect. 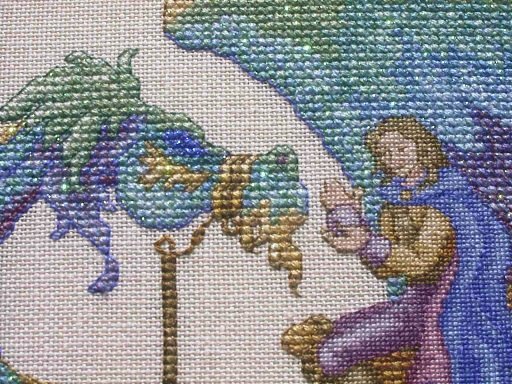 I also did the knot work in the border with a long stitch as opposed to a backstitch. The rider was designed one over one. The framing was done by Dan Melvin of Matte Ink. I chose a gold inner matte (to balance out the sparkly dragon), a teal middle matte, and a purple outer matte. I have no purple in my house, so finding a spot for this one will be interesting. If I remember correctly, the frame was more of a gold and Dan did a special wash to give it more of an antiqued look.